You will probably by now have seen the reports of the recent deaths of Mavis Batey MBE (5 May 1921 to 12 November 2013) and Ted Fawcett OBE (2 September 1920 to 19 October 2013). 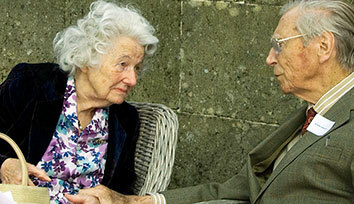 They both had distinguished war records, Mavis as a code breaker at Bletchley Park, and Ted with the Royal Navy. And, some years later, both went on to be very important figures in the story of The Garden History Society. Mavis served as honorary secretary to the GHS from 1971 to 1985, and was our president from 1985 to 2000, whilst Ted served several terms as our chairman, and was elected a vice president of the GHS in 2010. They remained active supporters of the GHS to the end, with Mavis having signed off the new Conservation Plan for Bletchley Park, compiled by Dr Sarah Rutherford, in the last few months. Mavis and Ted played a large role in welcoming younger generations into the GHS, helping make it the friendly Society that we all know it to be. Our picture shows them deep in conversation at Petworth House, at the wonderful party we held for Mavis’s 90th birthday, in 2011. Earlier tributes to Mavis and Ted appeared in other issues of GHS news, to Mavis in GHS News 87 Spring 2011, p18, and to Ted in issue GHS News 86 Summer 2010, p12. The most recent edition of our journal Garden History, enclosed in our December 2013 mailing, was dedicated ‘to the memory of these two much-loved garden historians: Mavis Batey (1921–2013) and Ted Fawcett (1920–2013)’.